Most people know what wills are, and what role they play in a person’s estate plan. However, the term living will often causes some confusion, especially if confused with a living trust. A living will is different from both a living trust and a will, and serves a distinct purpose. 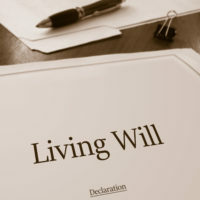 A living will is a legal document that directs how a person’s healthcare needs will be handled if the person is incapacitated and unable to make decisions. The living will leaves instructions on the kind of medical procedures a person would like performed, or those he would not like performed, in the event of his incapacitation. For example, in a living will, a person can decline to be kept alive by artificial means. The living will is also usually used to designate a health care proxy who would be in charge of ensuring that the instructions in the living will are followed. Having a living will can help settle disputes between family members on what should be done to keep someone alive if they get incapacitated and cannot talk or otherwise express their wishes. Without a living will, there may be disagreements and lawsuits to settle what the incapacitated person would have wanted to happen. These kinds of disagreements may happen, for example, when a spouse wants to terminate life support and the parents of the patient do not and insist that the patient would have wanted to be kept alive by any means necessary. A well drafted and executed living will creates a presumption that it represents the wishes of the person who executes it. When a person makes or writes a living will, he has to have the living will witnessed by two people. One of the people who witnesses the signing or execution of the living will cannot be related to the person executing the will by blood or be his spouse. This does not mean that the person has to keep the existence of the living will a secret from the people who are most likely to disagree about his care later on. In addition, once a person executes a living will, he should also make the document available to his primary care physician and have it made part of his medical records. A living will has no effect after a person’s death. The instructions in the living will are supposed to only cover the person’s medical needs while he is alive and incapacitated, and generally has no function after the person’s death. Living wills can be used in conjunction with a last will and testament that distributes a person’s assets as part of the person’s larger estate plan. If you are unsure of how a medical proxy, a living will, and a power of attorney can fit into your larger estate plan, you should seek legal assistance from an experienced estate planning attorney. For these and other estate planning needs in The Villages, Florida, contact the Millhorn Elder Law Planning Group for a consultation today.